I have come, not to disturb or destroy any faith, but to confirm everyone in his own faith so that the Christian becomes a better Christian; the Muslim, a better Muslim; the Hindu, a better Hindu; the Buddhist, a better Buddhist. Love is God, God is Love. Love more and more people, transform Love into Service, Service into Worship; that is the highest spiritual practice. Suppose you are asked: "Who created all this multiplicity in the world; who is responsible for all this variety?" What will you answer?.... The correct response is, "There is no multiplicity at all!".... The one divine self remains the one self forever. You mistake it as many. The fault is in you. Correct your vision. Remove your delusion. The divinity did not change into the world just as the rope did not change into a snake. In the dark you mistook the rope to be a snake but it remains a rope. So also, the divine self remains the divine self though your ignorance of this fact makes you see it as world.... The world of diversity stands on one leg called delusion. Cut down that leg and the world falls.... I often tell you not to identify even me with this particular body. You do not understand. You call me by only one name and believe I have only one form, but there is no name I do not bear and there is no form which is not mine. After long searches here and there in temples and in churches, at last you come back completing the circle from where you started, and find that he for whom you have been seeking all over the world, for whom you have been weeping and praying in churches and temples, on whom you were looking as the mystery of all mysteries, is the nearest of the near.... your very self.... the reality of your life, body and soul. Assert it! Manifest it! You as body, mind or soul are a dream. But what you really are is pure existence, knowledge, bliss. You are the God of this universe. You are creating this whole universe and drawing it in. To gain the Infinite, the miserable little prison individuality must go... Follow the heart. A pure heart seeks beyond the intellect. It gets inspired.... Within you is the real happiness. Within you is the mighty ocean of nectar divine. Seek it within you. Feel it. Feel it. It is here, the self. It is not the body, the mind, the intellect. All these are simply manifestations. Above all these you are. You appear as the smiling flower, as the twinkling stars. What is there in the world which can make you desire anything? "Love All -- Serve all." "Help Ever -- Hurt Never." 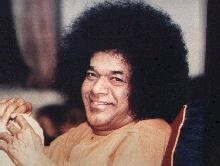 Get this125 KB mp3 file with Sai Baba sounding the Gayatri Mantra - it's only about 30 seconds long. This is the actual voice of one cosmic avatar. It has a very nice effect - and can be set to play over and over on most of the free sound players. Few people in previous generations - (if any) have had such treasures freely available to them. I have not come to create followers, each of you should continue to develop within your own religious tradition. A real disciple is one who will respect the traditions. Respect your own religions, your own ideologies, in brief, your own thought form, and you will experience the Master. Even when you see Me, do not run after Me. If you run after Me, you will lose Me. If you parade Me, you do not know who I am. I cannot be monopolized, I belong to everyone. Click on the "Donate Free food" button and money for food will be donated for every click (limited to one per day per person). You pay nothing and hungry people get fed. Please bookmark this and help out every day. It only takes about 10 seconds. !